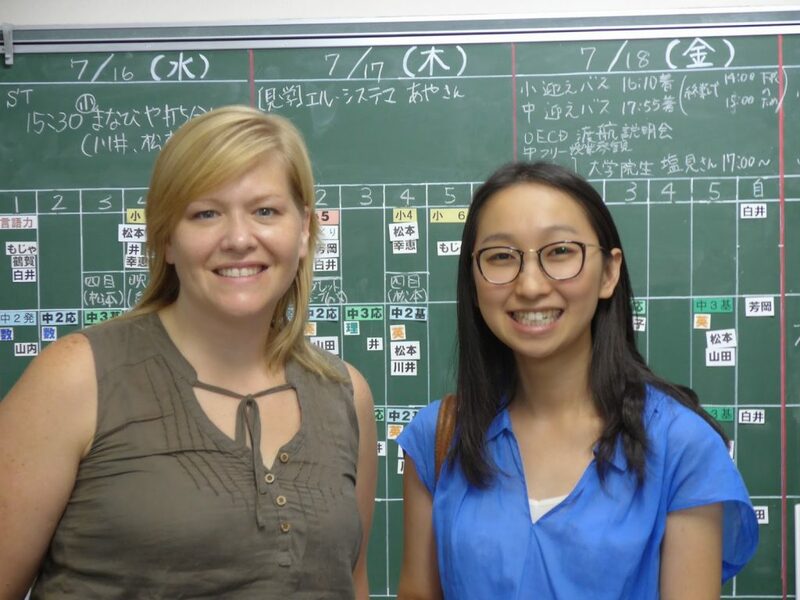 Our Executive Director Christina Rose is recently back from her week long trip to Japan, where she visited partner schools and met with educators, administrators and students. The purpose of trip was to learn about Japanese culture and strengthen partnerships with Creative Connections’ program schools throughout several regions of the country. 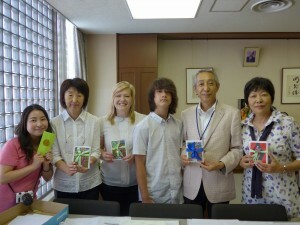 In the upcoming 2014-2015 school year, sixteen Japanese classes will participate in Creative Connections’ ArtLink program, a 40% increase from ten classes in 2013-2014. 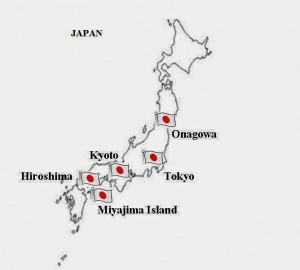 Both the trip and the growth of ArtLink-Japan are made possible through the generous support of theUnited States-Japan Foundation. 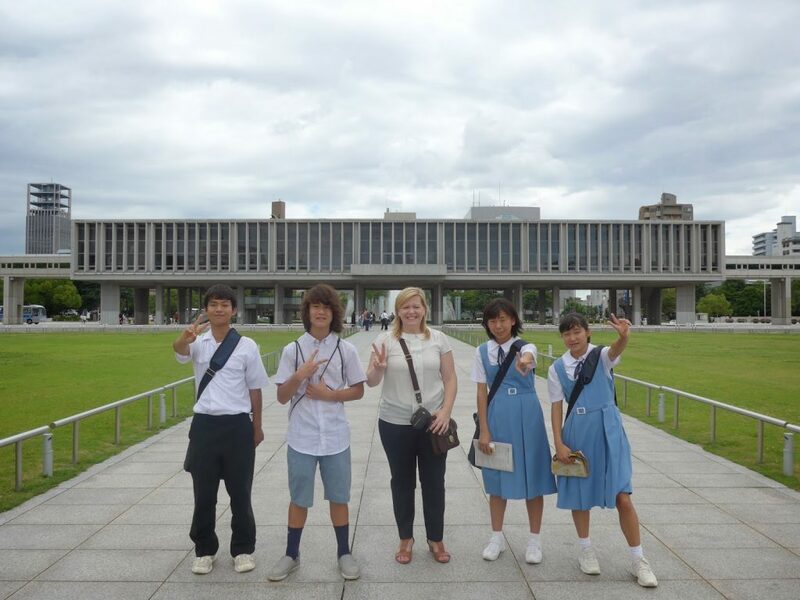 Christi and her son Evan started the trip with three days in Hiroshima, with a full first day spent participating in the Mihara Junior High School’s 2014 Peace Project, which brought educators participating in Mercy College’s Teach Japan program to Hiroshima’s Peace Memorial Park for a day touring the Memorial Park and engaging in a Peace Assembly discussion forum. Hiroshima’s Peace Memorial Park is located in what was the city’s busiest commercial and residential area before it was destroyed by the world’s first atomic bombing during World War II. It is dedicated to protecting the memory of the city of Hiroshima and also serves to promote the memory of the nuclear horrors as a means to advocate against nuclear proliferation and to promote world peace. The following morning was spent visiting Honkawa Elementary School (located just a few blocks from the epicenter of the bombing), where Christi and a group of teachers from Mercy College met with the Principal and Vice Principal. 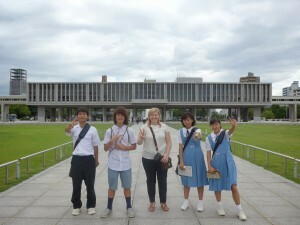 In the afternoon, Christi and her son traveled to Mihara Junior High School attached to Hiroshima University with Professor Seiji Fukazawa whoserved as the school’s Principal until March 2014. Under Professor Fukazawa’s leadership, Mihara School has been a partner school in Creative Connections’ ArtLink program since 2008. 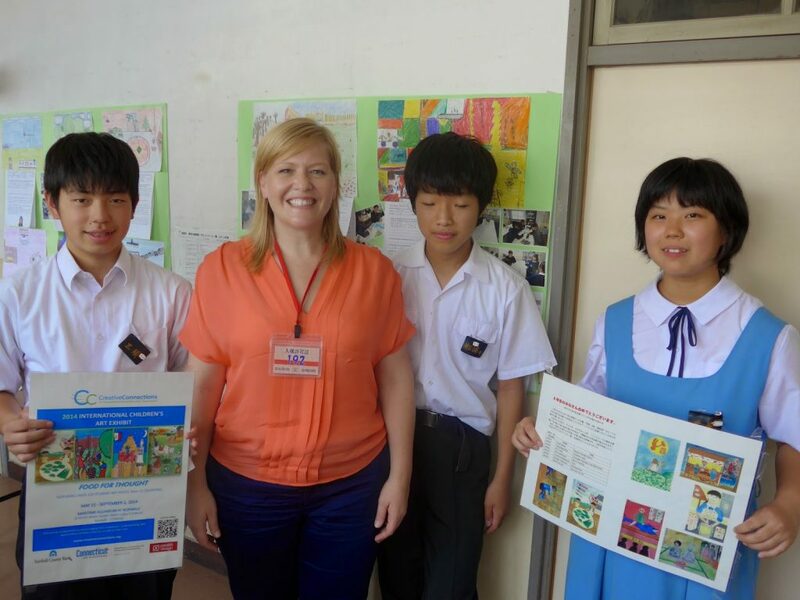 In May, a Mihara School class was honored as the 2013-2014 ArtLink Partner of the Year. Professor Fukazawa’s leadership, Mihara School has been a partner school in Creative Connections’ ArtLink program since 2008. 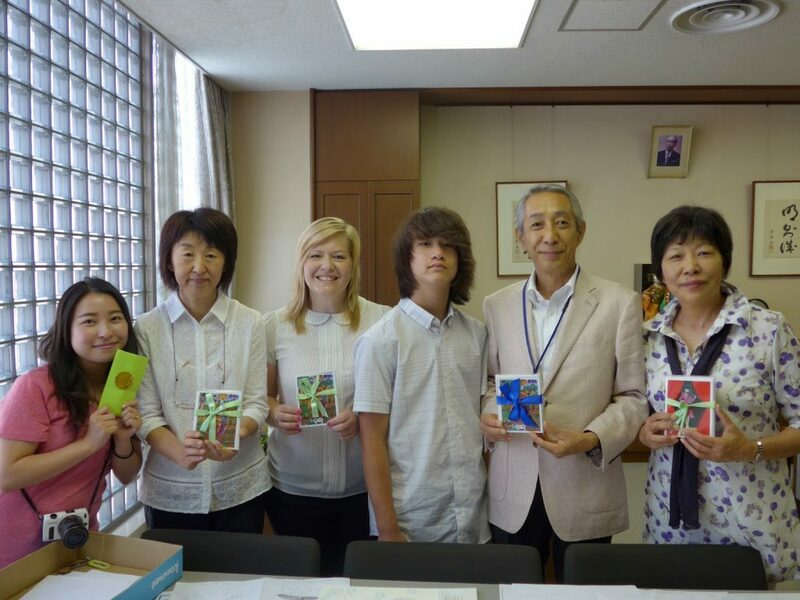 In May, a Mihara School class was honored as the 2013-2014 ArtLink Partner of the Year. Like most school children in Japan, who are in school until mid-July, the students at Mihara were in the middle of their exams. In spite of that, the students were gracious and enthusiastic hosts.During her visit, Christi met with the Principal, Vice Principal and several teachers. The next few days included visits to a historic shrine on Miyajima Island and a brief stop in Kyoto on the way to Tokyo, where Christi met with Creative Connections’ translator and toured one of the City’s temples. 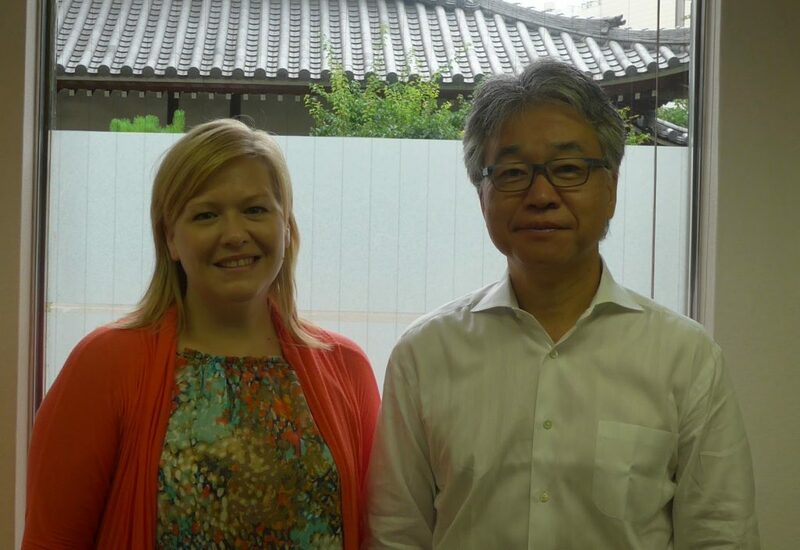 Christi and her son spent Monday morning at the United States-Japan Foundation’s Tokyo office meeting with Mr. Tomoyuki Watanabe, where they discussed the exciting growth of ArtLink-Japan. On Tuesday, they traveled to the city of Onagowa, to visit an after school program run by Tokyo-based Katariba, which translates to “place for sharing.” Onagawa is located on the Pacific coast and experienced drastic devastation in the March 2011 Tōhoku earthquake and tsunami. Ten percent of the town’s population perished and eighty percent of the buildings and infrastructure were destroyed. 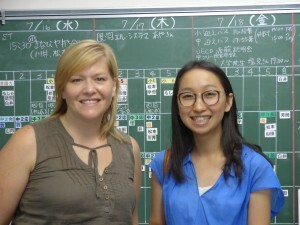 Katariba seeks to restore the educational infrastructure of the community through its Collaborative School, which opened in July of 2011 and operates 6 nights a week for children in the surrounding area.During the visit, Christi met with Chihiro Yamada, Katariba’s English teacher, who provided a tour of the town and their program. The day included an opportunity to speak with middle school students during their English lesson. The final day of the trip was spent at the Kosei Gakuen School in Tokyo, with Principal Hideo Yamauchi, Vice Principal Mayumi Inoue, as well as the English and Art teachers. Kosei Gakuen, an all-girls Senior and Junior High School, is a new ArtLink partner school in the upcoming 2014-2015 school year. Christi was honored to view the art pieces that the students had already starting working on for this next year – very impressive considering that the program has yet to officially start. Since returning from Japan, Christi feels “we [at Creative Connections] now have a deeper understanding of our partner schools in Japan, which will allow us to better serve that part of the program, both for the Japanese schools and their American partners.” She looks forward to the expansion of the ArtLink program in Japan in the coming year and continuing to expand Creative Connections’ depth of programming in the years ahead.